In a recent Food Standard Agency (FSA) poll of 2,000 people, 85% were in favour of catering outlets providing nutritional information for the dishes on their menu. Only 2% of the respondents said that they would be happy for the information to be made available on the company's website. Furthermore, from December of this year, you will have a legal obligation to provide your customers with information about allergens in the food that you serve them. The agency followed up with focus group research which showed that most people favoured simple data at the point-of-sale to more comprehensive information available elsewhere. "We're used to seeing nutritional information when we're shopping and there's no compelling reason why we should not have more consistent information when we eat out", said Tim Smith of the Food Standards Agency. The overwhelming consensus is that more diners are now demanding this information. This trend has already been recognised by several of the major industry players. McDonald's, KFC, Pizza Hut, Starbucks and Marks & Spencer are all on board. That's all very well but, how is an independent caterer like yourself supposed to provide this information? As well as the Allergen Warning Matrix Report, you can also produce a Special Dietary Requirements Matrix report if desired. With the One-Glance Menu Summaries, MenuAnalyser will provide your staff with all the information that they will need to answer the vast majority of customer requests for information about the dishes on your menu on a one or two page report. 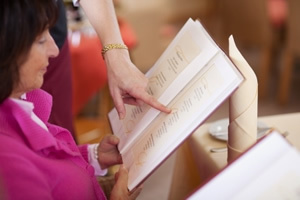 A list of every dish on your menu with calorie, fat and sugar level information, together with a quick-reference guide showing the suitability of your dishes for patrons with special dietary requirements.